he spire on top of France's Notre Dame Cathedral collapsed during a huge fire on Monday. Images of the blaze showed plumes of smoke rising from flames at the top of the building. "Everything is burning, nothing will remain from the frame," Notre Dame spokesman Andre Finot said, according to the Associated Press. The Paris police department said that nobody had died. Junior interior minister Laurent Nunez said that nobody had been injured. CNN reported that the cause of the fire in the 12th-century landmark was not immediately apparent but noted that a Paris prosecutor had opened an investigation into the fire. 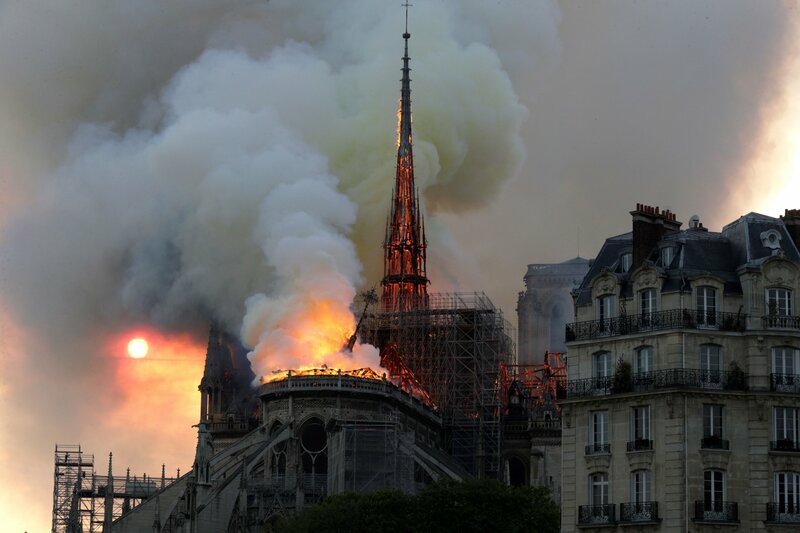 The fire started around 6:50 p.m. local time, just minutes after the cathedral closed to the public, according to the Paris fire department. About 400 firefighters are trying to control the flames, according to CNN. French fire services said they were not sure they could stop the spread of the blaze, news outlet Agence France-Presse reported. "There’s a risk that the great bells fall. If the bells fall, it’s the tower that collapses. There are firefighters inside and outside. The next hour and a half will be crucial," commander general of the Paris Fire Brigade Jean-Claude Gallet told CNN around 4:30p.m. ET. "We need to win this battle and block the spreading of the flames. The most efficient action is from the inside. We are not sure if we will be able to stop the spreading of the flames to the North Tower." French media had reported that the Paris fire was "potentially linked" to $6.8 million dollar renovation work happening on the peak of the church, citing the Paris fire brigade. Images from last week showed scaffolding around the church's cathedral. Firefighters rushed to save the art inside the building, which holds a number of historic art pieces. Initially they had difficulty reaching the cathedral because of rush-hour traffic. Anne Hidalgo, the mayor of Paris, tweeted, "A terrible fire is underway at Notre Dame Cathedral in Paris. The fire brigade are trying to control the fire. We are mobilized locally in close connection with church authorities. I ask everyone to respect the security perimeter." President Emmanuel Macron tweeted, "Notre-Dame de Paris is engulfed in flames. Emotion of a whole nation. Our thoughts go to all Catholics and all French people. Like all our compatriots, I am sad this evening to see this part of us burning." He canceled an important speech that had been scheduled to take place on Monday evening. He later said at an event Monday that "they think it was caused by renovation. I hope that's the reason. Renovation, what's that all about?" "Heart-breaking scenes of Notre Dame cathedral in flames. London stands in sorrow with Paris today, and in friendship always," London Mayor Sadiq Khan wrote on Twitter. The Metropolitan Museum of Art in New York also expressed its condolences, tweeting, "The Met and the collective cultural community are watching in shock and horror at the fire engulfing Notre-Dame Cathedral. We are sending all of our support and strength to the people of Paris—and stand ready to provide any and all resources we can."